Sports of all kind are a huge part of modern life. But there is only one true original: Athletics. Our bodies are made to run, jump and throw – it’s in our nature. From the moment we are born, we start to test our limits and expand our capabilities. Games in the school playground help us to bond and let off steam. As we grow and learn, we instinctively strive to better ourselves, and we seek out competition. Elite athletes provide us with inspiration, and grass roots athletics grants us opportunity. At Dartford Harriers AC we share England Athletics’ desire for the sport we love to be the number one in the nation’s hearts. By serving the local community, providing skilled coaches and dedicated volunteers, we strive to help athletes of all abilities, and their families, to enjoy participation and success in this wonderful sport. Whilst we are proud of our athletes’ achievements, it’s certainly not all about winning. The right sort of physical activity can help with the prevention and management of medical conditions. It can help with the alleviation of stress and depression. Athletics can build self-confidence, and provide a sense of community. 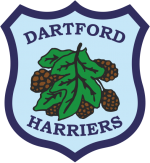 Dartford Harriers is among the leading athletics clubs in Kent, with a history stretching back to the 1922, making it one of the oldest clubs in the country. Nowadays the club has a number of highly talented young International athletes that place the club in a strong position to push it into the higher echelons of UK athletics and towards a bright new future. We are a very friendly club that caters for all ages and abilities, with the aim to inspire, promote and coach athletes to their full potential. Amongst our committed coaching staff we have: a current England Team Endurance Coach; a pole vault coach who has been head jumps coach at international level; an Olympian hammer thrower, World Masters Championship medalist in the marathon; a GB International shotputter and bobsledder; and the Kent County Athletics Association President. Most of our training takes place at Central Park Athletics Arena, Cranford Road, Dartford Kent, DA1 1JP. We hold coached training sessions on Tuesday, Wednesday, Thursday, Saturday and Sunday. Before attending the track, please get in touch with our membership secretary to learn more about the suitable groups you can join and the days and times they train, and to agree a specific joining date. To ensure you join the right group for your own level of development, preferences and goals, please get in touch with our membership secretary via the “Contact us” page on this website. We aim to respond to all new membership enquiries within 48 hours. For some popular groups with maximum number, we will hold trials periodically and admit new members as capacity permits. Find out more via the membership secretary. Once you have made an enquiry with the club membership secretary, you will be given an approval code which you can use to purchase your membership on the shop page of this website. Our club is run entirely by unpaid volunteers. Accordingly, club members are expected to lend a helping hand from time to time to assist with the smooth running of the club. Amongst other things, this includes all club members helping to marshal our main annual fundraising event, the Dartford Half Marathon, when it takes place in March. We understand that some members may not be available to assist on the day due to other commitments. In those circumstances we kindly ask that members who cannot attend please arrange for a family member or friend to help out in their absence. Please find out more via our Volunteering page.